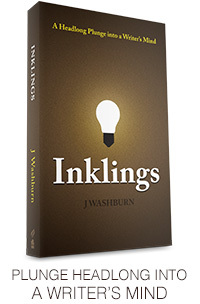 Author J Washburn: What tone should I use when I write an English paper? What tone should I use when I write an English paper? If you haven't heard, I have six weeks to write my master's thesis (last day to schedule a thesis defense is June 1st), or I won't graduate in August. Which would be a major bummer. Professor Trent Hickman, the graduate coordinator for the English department at Brigham Young University, stood at the front of the class—a man who, from his classic tie and charcoal-gray hair to his clever humor and keen wit, embodied the essence of scholarship. This was an intro to grad studies course, and he kept us entertained and interested while providing the knowledge we needed to follow him in his career path. On that particular day, we were discussing academic conferences. To get accepted at a conference, he explained, you have to write and submit an amazing abstract; if they like it, they invite you to come read, with sweaty palms and all, in front of a crowd of academics. Then he gave us four pointers for when you are face to face with this audience: First, don’t just stand and read your paper; look your audience in the eye. Second, present a version that is more informal and conversational than what you would send to get published in an academic journal. Third, make some asides so people can see you are a real person. And finally, make it more explicit—clearer in its points—than something for a publication. This advice rung true, maybe because it seemed intuitive—the natural thing to do—the thing anyone would do. It also struck me as odd that following this advice meant deviating from the academic draft that the (theoretical) conference accepted in the first place. I was not sure why these two versions needed to be different—contradictory even—so I looked at the differences more closely. If the face-to-face version was clearer, that suggested the written version would be less clear. If the face-to-face version showed a real person, that suggested the written version would show an impersonality. If the face-to-face version was conversational, that suggested the written version wouldn’t resemble conversation (which also made me wonder how one can communicate if not through conversation—perhaps through ones and zeroes). And finally, if the face-to-face version included eye contact, that suggested the written version lacked a real connection between the author and audience. Taken in three-sentence bursts like this, you might think this is not so bad. But when consumed chapters at a time, or books at a time, it can be overwhelming (and my peers and our instructor agreed). 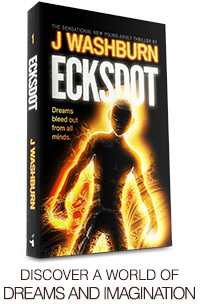 The general consensus was that the book’s conclusions were often obscure and difficult to pinpoint, and when you did hunt them down, it was only after a great deal of effort. I do not mean to degrade Gross’s book; the concepts in it are excellent, the research is exquisite, and the level of scholarship is far beyond my current capacity. But the prose itself is also far from the face-to-face style we have discussed. You will notice that he repeats the concept three times, first in an overarching, abstract way, next in a simpler way, and finally in concrete dialog. This is clearer in its points. (Incidentally, I often revisit this passage with my writing students, as I think it is a stellar example of writing that is personal.) Reading Solomon’s book, some might disagree about the conclusions he comes to, but they would never disagree on what those conclusions are. That is because reading this text is like having a conversation with the author. Nobody wants to sit through a boring speech—audiences are quick to critique a speaker who is distant, monotone, and who never looks directly at them. In a setting like this, when author and audience are face to face, being personal is obvious. Yet when the audience is not there, when it is just the author and the keyboard, being personal is easy to forget. Some hesitate to criticize this aspect of academic writing. But that is my purpose in this article—I argue that we should remember the humanness of our readers, and, even when we write, we should look our audience in the eye. As we begin, allow me to give the scope of what follows. Lawrence Green, in the Encyclopedia of Rhetoric, says that out of Aristotle’s three rhetorical pillars, pathos “has occasioned the greatest controversy” (554). My article—which makes the case for this personal connection between author and audience—is in essence arguing in favor of bringing pathos back into academic rhetoric—as a topic of discussion, and also, more importantly, as a method of discussion. First I will look at current beliefs on what constitutes “academic rhetoric” as well as some potential logical fallacies within that description. Then I will review the history—how pathos, the emotional appeal, was part of the foundation of rhetoric, how it was exiled when logos became king, how this coup left the foundational triangle of rhetoric lop-sided and only partially functional, and how some disciplines have re-integrated pathos (and even offered scientific justification for using it). 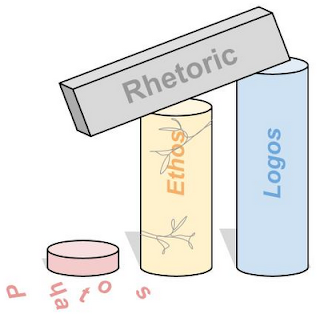 While I will show that rejuvenating pathos will strengthen our influence as rhetors and teachers of rhetoric, I also suggest that because the pillars of rhetoric are closely linked, strengthening one will strengthen the others; specifically, I believe that rebuilding pathos will reinforce the pillar of ethos. Finally, I will recommend some ways we can begin to change a genre (a titanic undertaking), both through gaining deeper emotional intelligence—a conceptual point—as well as through making specific stylistic choices in our writing, concluding with speculation on how the future could be if we manage to make this change. The comments made in the above article are insightful and very applicable in our educational system. Aristotle will be happy, his teachings are being resurrected and applied.